Display your artwork with this sturdy, sophisticated museum-quality art hanging system. The 4 rails will sustain loads of 66 lbs each and are available in classic white or modern matte silver. If wanting to paint the rail, choose white then lightly sand, clean and paint to desired color. Two or more pieces of art may be hung, one above the other, on the same cable. 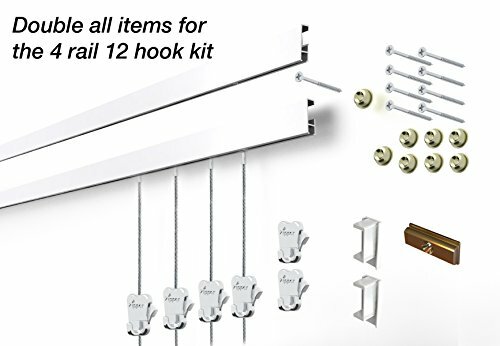 This rail kit contains: Four 59" aluminum track picture rails (cliprails), Eight 59" cobra steel cables (the cobra head can be hooked directly into the bottom channel of the rail without needing to slide it into place), Twelve Zipper® hooks (bears weights up to 44 lb each), 4 end caps, 2 rail connectors and rail installation hardware. To hang more frames purchase extra cables and hooks. For further variety, check out our other Shades Picture Hanging products. You can download the installation instructions from the "Installation Manual" under "Technical Specification"
If you have any questions about this product by Stas Picture Hanging Systems, contact us by completing and submitting the form below. If you are looking for a specif part number, please include it with your message.